Most of the western region of the tropical South Pacific benefits from the Southeast Trade Winds. These are produced by the effect of Coriolis deflection on surface air drawn towards the low pressure region at the Equator, called the Equatorial Trough. The Coriolis deflection of winds, which is to the left in the Southern Hemisphere, is caused by the Earth's rotation. The Southeast Trade Winds are persistent for most of the year, although they tend to be weaker in the summer season (from November to April), and stronger in winter (from May to October). 1 For Fiji: http://www.met.gov.fj; for French Polynesia: http://www.meteo.pf; for New Caledonia http://www.meteo.nc; for New Zealand: http://www.niwascience. co.nz; for Samoa: http://www.meteorology.gov.ws; for Tonga: http://www.mca.gov. to/met; for Vanuatu: http://www.meteo.vu. is in marked contrast to high volcanic islands, where the orographic effect is the most important rainfall-generating mechanism on the windward southeast sides of islands facing into the Trade Winds. This can result in big geographical variation in annual rainfall totals across many high islands, and local people often refer to the 'wet' and 'dry' sides of their islands. The interaction of volcanic relief and the Southeast Trade Winds on rainfall distribution is illustrated in Table 1.1 for Viti Levu island in Fiji. Suva city on the southeast coast of Viti Levu lies on the wet side of the island, and receives almost 3,000 mm of rain annually during 240 rain days. Lautoka city on the northwest coast enjoys a drier location in the lee of the volcanic highlands in the interior of the island. 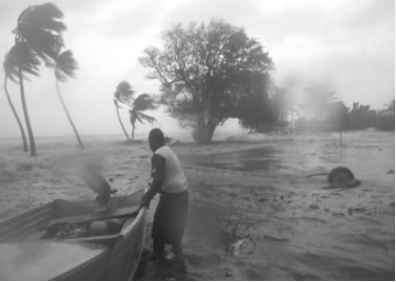 Lautoka therefore receives 1,903 mm of rain a year in less than half the number of rain days experienced by Suva. Relative humidity is correspondingly higher in Suva than in Lautoka, and as might be expected, this has an inverse effect on daily sunshine hours for the two cities. 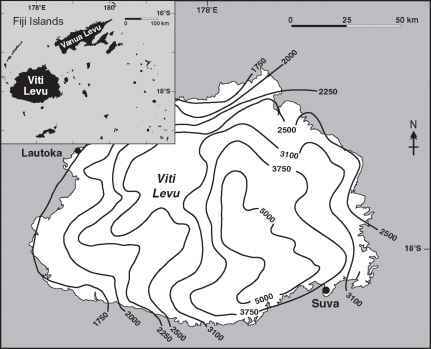 Isohyets extrapolated across entire Viti Levu are seen in Fig. 1.3, showing that the wettest part of the island is the central volcanic highlands. They are separated by volcanic mountains that rise in the centre of the island to over 1,300 m above the sea level. Data Source: Fiji Meteorological Service. Fig. 1.3. Isohyets of annual precipitation on Viti Levu, the main island in Fiji, illustrating the difference in rainfall between the wet windward and drier leeward sides of the Island. The pattern is produced by the orographic effect of the high interior volcanic relief on the dominant Southeast Trade Winds. Source: Fiji Meteorological Service. Why is the humidity high in Suva than in Lautoka? Which part of the year is southeast trade winds rain experienced? What is the other name for southeast trade wind?